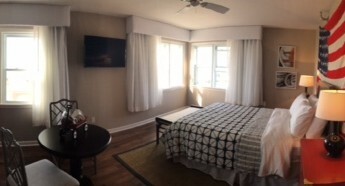 Clegg's Hotel, located in scenic Ocean Beach, New York, is a beautiful location offering hotel rooms for rent and special event hosting services. We offer basic hotel accommodations in the center of Ocean Beach with a bay front property. Our waterfront hotel is located just a five-minute walk from the Atlantic Ocean. We offer amenities including bicycles, beach chairs, beach umbrellas, and board games for guests to enjoy. For your convenience, we also offer concierge services to make reservations at restaurants or rent a water taxi. Room service is also available. All suites offer a beautiful view of the Great South Bay or our garden. Each hotel room includes a private bath, kitchenette, and one full-sized bed. The kitchenettes are furnished with a refrigerator, microwave, and sink—all of the amenities of your kitchen at home. For an additional cost, the units can sleep a family of four. All of our guest rooms have a European style design with one full-sized bed or two to three twin beds. Guest rooms share the use of four private bathrooms with skylights in the hallway on each floor. 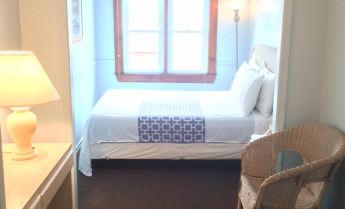 The guest rooms offer a water view or a view of our small town. Our rooms are basic and do not have television or phone service, as most guests come to enjoy the peace of our small seaside town. The total cost of your stay is required to guarantee a reservation. 100% will be charged upon making a reservation and is non-refundable, non-transferable and no changing the arrival date . We accept all major credit cards. Contact us in Ocean Beach, New York for more information about our hotel rooms or special event hosting.